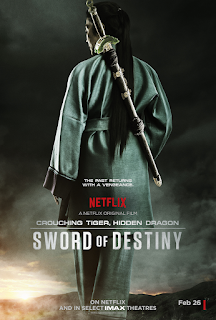 I saw finally saw Crouching Tiger, Hidden Dragon: Sword of Destiny yesterday on Netflix. I rather enjoyed it (was preparing myself for disappointment). It is a very different film from the original with quite a bit more action. While I think the original is a better film by traditional standards, in a lot of ways (though certainly not all) I found this to be a better wuxia film (though it did have some issues). The original is stronger in terms of cinematography and developing the story, but Sword of Destiny works better in terms of action and fight sequences (the fight sequences in Crouching Tiger were great, but here Yuen Woo-Ping is able to give it a more prominent role). I do think a lot of people who saw the first one will be disappointed by the sequel if they go in expecting a similar experience. If you like wuxia for the action, then this movie will serve you well (and I have to admit, while I love a good story, the main attraction for me with wuxia is the incredible swordplay). The story picks up about fifteen years after the last film with Michelle Yeoh reprising her role as Yu Shu Lien. She arrives in Peking at the residence of Sir Te, who has recently passed away. Hades Dai, Chief of the Western Lotus Clan, is trying to become the leader of the martial world and to do that he needs to possess the Green Destiny. He sends one of his men, Wei Feng, to steal it and Yu Shu Lien is once again in the position of protecting the sword (this time on behalf of the son of Sir Te, who she helped in the original). Another mysterious figure, a girl named Snow Vase, helps intercept Wei Feng and becomes Yu Shu Lien's disciple in the process. Yu Shu Lien calls on heroes of the martial world to help her protect the sword and a ragtag team of warriors, lead by Silent Wolf (played by Donnie Yen) answer the call. I don't want to spoil the plot so I all I will say is the rest of the film follows the characters as they protect the sword against Western Lotus Clan. We also learn more about the background of the lead characters. It is very hard to compare this with the first film, if only because they are so different. The action is more frequent and has a lot more energy to it. Whereas the first movie took its time building and reveled in languid scene of flying swordsman, this has a bit more punch to it. It is also the movie's biggest strength. I think the heavy use of action, will turn off some viewers who might be expecting the more story focused and ruminating pacing of the first. For me, I was glad for it, because I think the solid fight choreography helped overshadow some of the film's weaknesses (and because it was directed by Yuen Woo-Ping, it makes sense for him to play to his strength). Like the original movie this is a Chinese and American Production, but it is more noticeable because the film is shot in English (which has its benefits and its negatives) and much of the cast seems to be American and international actors). One of the down sides of the English language is many of the American actors chose to speak (or maybe they were directed to do so) in a quasi-Shakespearean accent that draws a lot of attention to itself. The role community of martial heroes was more prevalent throughout as well (this is very much a "I need the sword to become master of the Wulin type story). Rather than focus on a small group of characters, Sword of Destiny has much more of a martial team approach (though Donnie Yen, Michelle Yeoh, Harry Shum and Natasha Liu Bordizzo are clearly the stars). The storyline is pretty good actually and quite simple. I won't spoil it, but I think they do a good job bringing Michelle Yeoh's character into the next segment. My understanding is the original movie was based on a series of wuxia novels, and I believe this one is also based on the next book in the series (however there is an english language novel for the movie, so it is unclear to me how much this new installment deviates from the original storyline----and the original novels are not translated into English as far as I know). I suspect they deviated a lot from the original source material but I cannot be sure. There are more supernatural elements in this one (that is sometimes in wuxia, but I did wonder if it was added in this case as it felt more heavy than normal--at least with one character in particular). The way characters are handled is a bit different from the first movie as well. Here it is more about stark characters who are part of a team and have chemistry. They delve into the background of the four chief protagonists, but the rest of the team has one or two major traits. I think this worked. I like having larger than life martial heroes in my movies. But it is definitely quite a different approach from the original film (which took more time building characters and was a more subtle in its approach). One thing that I rather liked were the characters backstories in this one. I don't want to spoil anything but there is a bit of mystery around some of the characters and you slowly learn their history over the course of the film. These yield some interesting surprises (in one instance helping to illuminate some of the material from the first film----though some may find that it undermines it I suppose). Personally I liked this and thought it complimented the first. One thing that really makes the movie work is the presence of Donnie Yen and Michelle Yeoh. They are both great in it and Michelle Yeoh's performance was magnificent. It is nice to see them working together in a wuxia film again, and nice to see that they are still able to pull of some pretty involved and graceful fight choreography. Yuen Woo-Ping directed both of them in the film Wing Chun (1994) and I couldn't help but think of that while I was watching Sword of Destiny. There was a bit of CGI but it was pretty seamless and used mainly to give the film a sense of scope and create a more awe-inspiring environment. I may just be immune to it at this stage (because a lot of Chinese wuxia films and shows make heavy use of CGI) but I felt it added rather detracted from the experience. The Sword of Destiny isn't perfect but it is a fun action-adventure movie and can help serve as a bridge into the wide world of wuxia for western audiences. I have zero complaints about the fight scenes (in fact many of them were more entertaining to me than the original movie's swordplay). They help carry the movie and give it plenty of energy. Some of the acting felt a bit out of place and some of the elements did feel a little too Holywood, but I think they did a good job conveying the idea of the martial world to viewers who may be unfamiliar with the concept. Whereas the first film touched on that idea at times, this one dives pretty deeply into it. Basically watch this one for the fight scenes, the exploration of the martial world, and Michelle Yeoh and Donnie Yen. It also has some interesting characters, but in some cases you might find yourself being distracted by the delivery (I at least found the old time english accents where they appeared jarring).